[next] The Velociraptor has 36-inch Toyo tires and and custom front and rear bumpers. This along with its 8-foot bed, make the Velociraptor one of the most striking luxury pickups around. 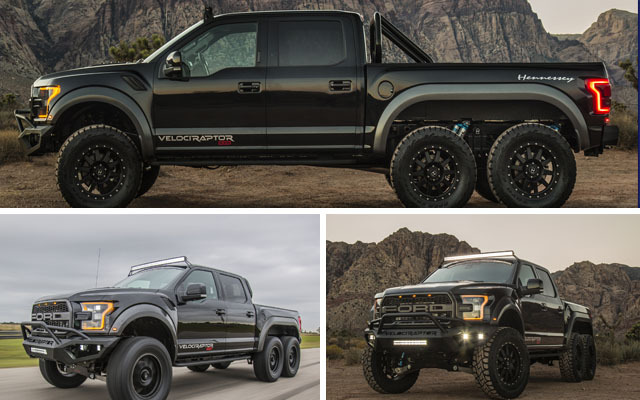 And how much will the Hennessey Ford Raptor ‘Velociraptor’ set you back? $350,000. You read that right, this modified Ford Raptor pickup costs more than a quarter million dollars. And that price is just the base model. If you have the money to spend, you can get a break upgrade kit, which will add an additional $22,000 to the base price. With a price like that, Hennessey Performance clearly understands that this truck is not for the general public. They are only going to make 50 of them, making them incredibly exclusive. We can pretty much guarantee you won’t be seeing these on job site anytime soon. If you want to read more stories like this, click on the NEXT POST button below! And don’t forget to SHARE this story with your Facebook friends!